William Merritt Chase, the direct and original interpreter of the American scene. William Merritt Chase was an international celebrity and a popular teacher at the Art Students League. His name alone helped to insure the success of the Shinnecock Summer School of Art. When land and financial backing became available by the Parrish, Hoyt, Porter, and Peabody families, Chase's attitude toward painting and style of living and philosophy of art solidified the notion of the first American Art Summer School. The Southampton Art Village was apparently the brain-child of Mrs. Hoyt, the daughter of Salmon P. Chase, the famous and wealthy Secretary of the Treasury during the Civil War. There was a McKim, Mead, and White house built for Chase and his wife and his nine children. There was a studio which today is owned and is being restored by Kate Spade and her husband Andy. 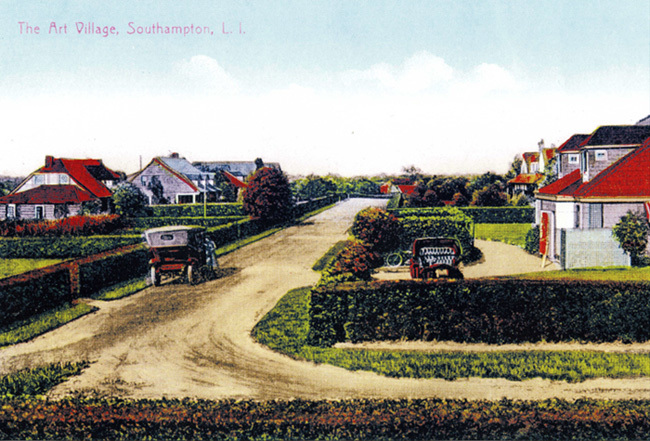 Also the land surrounding the studio was divided and numerous cottages were built on it. Together with the studio these dozen or more cottages came to be known as the Art Village, which remains in existence today. The entire concept was completed and ready for use by the summer of 1891. Chase was such a dandy that he often painted in this studio in a velvet jacket or a white flannel suit. The School became famous for its hi-jinks and social life. Gilbert and Sullivan operettas were also the rage. Two Briar Lane was once called Honeysuckles -- designed by Grosvenor Atterbury, and built for two sisters by their uncle, Samuel Parrish. This retreat is still complete with a broad lawn and numerous rare trees planted throughout the property. In the summer of 1891, the Art Village was seen thriving -- a special Hampton -- where art students from all over the country began to gather to share the common love for beauty in nature and in art. Southampton was civilized by now. This land originally belonged to the Shinnecock Indians, however they relinquished rights to it in a treaty of 1859 in exchange for title to the Shinnecock Neck land area. But the Hamptons were already fashionable as a summer resort. And the list of patronesses and promoters for the school reported in the New York World (on February 2, 1891) included such fashionable names as: Mrs. Astor, Mrs. Belmont, Mrs. Carnegie, Mrs. Vanderbilt, Mrs. Smith and Mrs. Whitney. Two events became a staple on the Southampton Social Calendar. One was the themed Costume Party and the other was called the "Tableau" in which Chase's family and students would pose in full costume, representing some well known paintings - the most memorable being Mrs. Chase as Dagnan-Bouveret's Madonna and Hellen Chase as Velasquez's Infanta. There were even cake walks, charades, and German plays. A study of Chase is as good an introduction as any to a general understanding of American art. In common with all our "old masters" Chase possessed a lucid and dispassionate vision, somewhat lingeringly Puritanical, that has been defined as American quietism. His versatility, his wide range of subjects and moods made him striking. He had been endowed by nature with a robust constitution to match his vigorous talent, and with a wholesomeness of mental outlook on life and art that kept him squandering his energy in a neurotic vacuum. There was Chase, the extraordinarily successful portrait painter, and Chase, the master of still-lifes in the grand manner that won him unstinted admiration; and Chase, the Impressionist, and early disciple of Manet, whom he was chiefly instrumental in making known and apprcieated in America. Then there was Chase, the direct and original interpreter of the American scene, particularly the pseudo-Bohemian life of the studios of that day; Chase the illustrator, and Chase the sculptor; Chase, the landscapist, Chase the student of mystery of reflected light; Chase the lecturer, and Chase the teacher of far-reaching influence at a crucial period in the development of Art in America - not to mention, Chase the sociable fellow, and Chase, the family man, father of nine children. Two Briar Lane reflects the style of this man, so it was decided to continue this theme. There is an authentic feel to each room.